Did Malayalam film producer Santhosh Kumar kill his wife, daughter and commit suicide? Bodies of all 3 found in a flat in Dubai. BANGALORE: A Dubai-based Malayalam film producer was found dead alongside his wife and young daughter, in what reports says appear to be a murder-suicide. Santhosh Kumar’s heavily decomposed body was found in his flat, right next to those of his wife Manju and daughter Gouri, reports the Khaleej Times. According to friends of the deceased, who spoke with that newspaper, the family had been impossible to contact since last Thursday, prompting an investigation that ultimately found them dead. The three family members were all found in the bedroom of the Dubai flat, after one of Kumar’s cousin notified police that the family was unresponsive to all communication attempts. Police discovered the grisly scene on Tuesday, bringing both the local community and Kerala’s film community into a state of shock. Local police in Dubai said that both Manju and Gouri were found with multiple stab wounds, indicating that Kumar likely stabbed them before taking his own life. While the circumstances initially seemed suspicious, police are now leaning towards viewing the case as a suicide, potentially brought on by financial woes that Kumar was allegedly facing at the time of his death. Santhosh Kumar was the owner of Souparnika Films, which was one of the names behind hit regional films such as Madambi, Neelathaamara, and Rathinirvedham. He reportedly moved to Dubai about five years ago, and managed a trading company based in Karama. 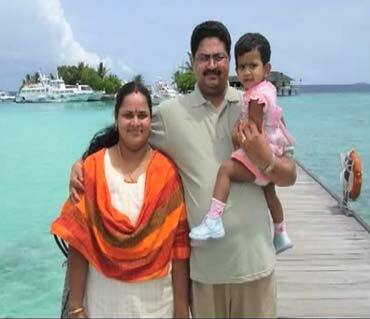 The investigation into the deaths of all three Kumar family members is still officially ongoing.